(Image: Area under Charing Cross Station, 1964, described in Nairn's London, from the Francis Frith archives). "This.... is the kind of thing that nails you to a place. The New Towns will never have it in a thousand years." Ian Nairn, Nairn's London. At the behest of a few people I've been reading Ian Nairn. Somewhat shockingly I'd never read him before and I owe my current interest largely to his ghost, the erstwhile editor of this blog. For some reason Nairn passed me by. I was familiar with the name and I knew of his association with the Architectural Review, but I had never sought him out to read. For me he lacked the glamour of someone like Reyner Banham and he wasn't part of the academic set of Alan Colquhoun and Kenneth Frampton, whose books tended to dominate architectural theory when I was studying. Nairn wasn't like any of those people. He was much more of a journalist, almost an old school Fleet Street hack, which is probably why he's venerated by writers more than architects. He also invented the Outrage column in AR, a feature that limped on into the '80's and '90's, but which was originally full of furious invective about the swathes of poor quality post war architecture. The vehement strain of dislike for suburbia that ran from E.M Forster, through Betjamen and Nairn has always been problematic for me too, suggestive of metropolitan elitism and class snobbery, which may be another reason I've never sought him out. Last month's excellent post over at City of Sound sealed the deal though, and I ordered myself a copy of Nairn's London, his 1966 guide to the city's architecture. One immediately striking thing about the book, apart from the consistently excellent and hugely entertaining writing, is the choice of buildings. Despite Nairn's much vaunted regard for good architecture of any period, there is very little modernism in his London. He likes Stirling and Gowan's Ham Common flats and both Lubetkin and Lasdun come in for some damning through faint praise, but there's precious little else. Instead, the book explores the stained and rained on London of Wren and Hawksmoor, Soane and Nash and Lutyens and Herbert Baker. He liked the less obvious examples of each and, even then, preferred the forgotten elevation or the unexpected view. 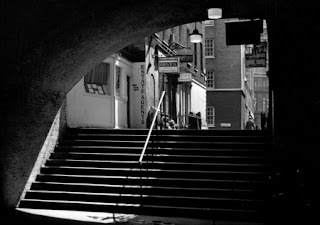 He spent a fair bit of time lurking down alleys and hanging around long forgotten corners, behind Hawksmoor's St George's in the East, for instance, or between the warehouses of Shad Thames. He appreciated the grim and the grotesque - his reference to St. George's "monstrous key stones" is particularly good - and a certain ballsy and un-English lack of restraint. Nairn's London is not so much a guide book though as a lament. There is a palpable sense of 'his' London disappearing, whether through crass commercial over-development or the thousand cuts of polite new modernism. Even the soot is fetishised here; he prefers St Paul's before it was cleaned and Hawksmoor's bombed-out churches to badly rebuilt ones. The London that comes across is the London that Nairn seemed to love: a slightly grubby, boozy place relieved on occasion by the glamour of a late night taxi ride splashing through the West End rain. There's an awful lot of pubs in Nairn's London too. He describes The Salisbury in Covent Garden as glamorous, which must have seem far fetched even then, but you get the impression he wasn't a man for slickness or flash. His humour veered towards the blokeish kind, full of bravado and declamatory sentences and he wrote like a man in a hurry to make his point. But he also had an ability to talk about Classical, Gothic and Baroque architecture in an informed, personal way. That combination seems almost impossible now when an appreciation of classical architecture amounts to an ideological position, a statement of aesthetic preference that supposedly requires no further elaboration. His description of John Soane's house is particularly sublime, a flight of lyrical fantasy that matches the extraordinary architecture. Nairn's attitude to modernism seems to have been one of sceptical disinterest. He was prepared to praise the best of it but his guide suggests such a thing was in short supply. Today, his pessimism at the quality of what was being built while he was writing the book seems sharply tempered by the knowledge that what came after was far, far worse. Nairn's London makes a sharply architectural companion piece to Norman Cohen's 1967 film The London Nobody Knows, itself based on Geoffrey Fletcher's book about fading London written at the start of the decade. I first saw Cohen's film in a screening organised by the band St. Etienne, who showed it alongside their own homage to London, Finisterre. Both films are in love with a particular vision of London, documenting its sleazy underbelly as well as its unexpected and difficult beauty. Both too attempt to capture a sense that the city is constantly being re-made, disappearing under 'improvements' that in turn will disappear aswell. The screening was at the Barbican, not mentioned in Nairn's book but a prime example of post-war rebuilding, which has in turn become a much-loved piece of London. The architecture of the post-war period now seems enviably well-constructed and put together in comparison with today's trespa clad tat so his despair strikes one almost as a luxury. Nairn's book is not a list of places to visit, so much as an inventory or what he thought London was about to lose. That explains its omissions and its relative lack of interest in the recently built. All those new buildings, it seemed reasonable to assume, were safe. Nairn knew this and he spent his time capturing the places he loved in sparklingly brilliant prose before both he and they were gone. Nice; but as one of the interpellated Nairn fans I'm going to be a bit pernickety. Firstly, re: suburbia, he's actually very keen on certain bits of it, if you delve into the more obscure bits of Nairn's London there's praise for Wembley and all sorts of similarly metroland places - but what he does stay pretty scathing about is the new towns, rightly or wrongly. Reading it back I think my post was more critical sounding than I meant it to be. Or at least there's not much in the way of outright praise in it. I should say therefore that I think Nairn's a) a brilliant writer and that b) I've still only read one of his books. But I think I was trying to add to the conversation initiated on the twitter and to Dan's excellent post over at COS, and avoid simply repeating how good he was. Because some of the descriptions in London are breathtaking - the one about Soane's house particularly springs to mind. As for the specific points, I have to plead a certain amount of ignorance although I agree that he's definitely no fogey in the Ingrams/Brooker mould. And I definitely want to and will read the other books. As for suburbia, well I think the way that line of thinking degenerated into the complacent snobbery of the '80's and '90's is hardly Nairn's fault. Excellent discussion. Charles, try to get hold of RIBA's journal of june 1966. It contains an article by Malcom MacEwen called MacEwen's guide to Nairn. Also in RIBA's journal (july 1966) there's Nairn's anwer to this article and other letters. It's hugely entertaining of course but I think it also clarifies some of your issues regarding the selection of buildings contained in Nairn's London. I've read everything (literally) that Nairn has written and I'm still confused regarding the suburbia issue. It's not that simple. Subtopia and suburbia are not the same as many think. I agree with Owen Hatherley, scratch around and you'll find Nairn airing some surprisingly positive responses to some surprising buildings and places - even in his journalism. Cumbernauld, the Strathclyde Hotel in Corby and, more mainstream, the Cummins factory, Darlington, all spring to mind. With David McKie I've a Nairn book project afoot, and so have begun immersion in his wider writings (it's true, he's for writers not architects) which could well be titled On a Good Day (but won't be...) Anyway here's a link, http://www.lrb.co.uk/blog (17 Feb.)....early days. Gillian, thanks for your comment and the link. I admit to not having read much of Nairn so my comments were based only on his London guide. Which I loved, but which surprised me in a lot of its choices. On the subject of subtopia I probably instinctively side with him which makes me nervous! This 'problem' with suburbia that it removes difference needs more serious and open-minded investigation than it gets I feel.